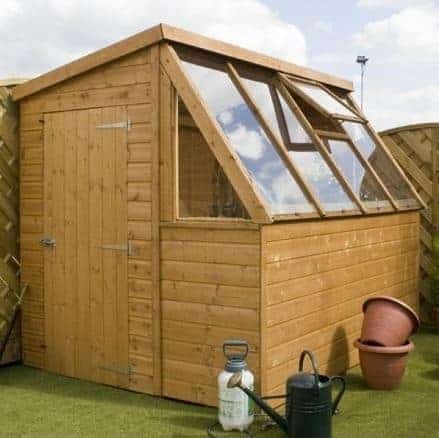 The 8’ x 6’ Premier Groundsman Potting Shed is a fantastic example of a space-saving combination shed, providing a storage facility and greenhouse-style design in one. A place where all of your gardening projects, flowers, plants and vegetables can flourish in a bright and organised environment. This 8 x 6 potting shed has a unique structure, and has also been constructed using tongue and groove work. This means that the cladding and the interior work on the walls and the floors will protect your structure from rot for 10 years. That’s a minimum, but there is a 10 year anti-rot guarantee to reassure you. Inside the building you have the benefit of having a special wooden bench where plants can be potted. A skylight window is hinged and allows plenty of light into the greenhouse, so you can control the temperature and humidity of the building. 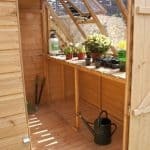 Internally, there is a built in work bench that can be used on a day-to-day basis for pottering around and organising your gardening projects, keeping the shed neat and tidy. Further shelving or storage could easily be added if needed to make the space even more suited to your particular needs. The Groundsman potting shed is the ideal building for the smaller garden, combining storage and a greenhouse-style environment to create the ultimate space for the enthusiastic gardener to work on their projects. 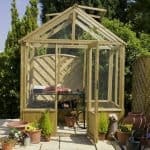 In this section we have a look at the potting shed’s many features and see how they could work on an everyday basis in providing the right garden building for your needs. Exterior: The potting shed has a traditional garden shed design combined with large, greenhouse-style windows, making the ultimate garden building. Constructed from Baltic sourced pine and using 14mm shiplap cladding, the shed is both durable and highly practical for purpose. Interior: The shed interior is essentially a blank canvas to allow the space to be used as you wish. 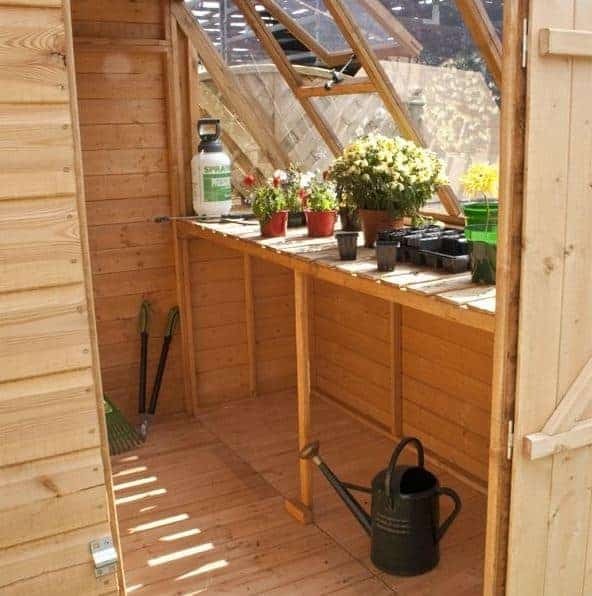 There is a useful built in shelf that runs directly under the side window area, ideal for storing those gardening projects to give them the optimum light from the sun. Windows & Door: The large windows allow an incredible amount of light into the shed to create an ideal environment for your growing projects to thrive. A single, hinged skylight window allows fresh air to enter and circulate the shed, preventing damp and rot. 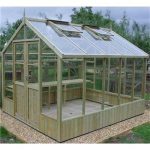 The single-sized door is adequate for potting shed activities and large enough to transport plants and the like in and out of the shed. Security: We understand that with a shed you may need the peace of mind of security for the contents stored inside. 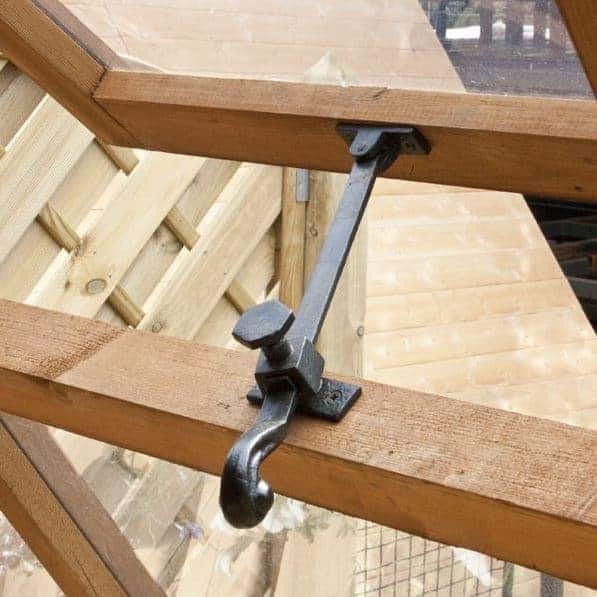 This particular model comes complete with a pad-bolt, ready for a padlock to be attached to enable the shed to remain locked whilst not in use. A padlock can be purchased independently at a modest price. 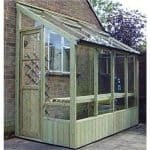 The potting shed will arrive at your door ready for self-assembly, however should you require a professional home installation service then this is available at an additional cost during the purchase process. The product will arrive flat-packed containing all of the timber panels, glazing, fixtures and fittings required for a straight-forward assembly process. It is recommended that two people assemble the shed together due to the size of the panels and the delicate nature of the large glazing panels. We expect that the shed could be assembled within a day by those with a basic understanding of DIY. 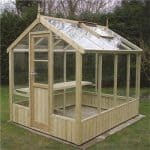 The potting shed has many features that make it a high quality and practical addition to your garden. Constructed from Baltic sourced pine, which is said to be denser and heavier than domestic pine, with 14mm shiplap tongue and groove cladding, the structure is solid and durable against the elements. It is recommended that the shed be placed on a flat, level foundation such as concrete or similar material. If no such base is available in your garden then a selection of bases are available to purchase as an additional extra. The windows are made from 2.5mm styrene glazing, which provides the right environment for the potting shed. There is a 10-year anti-rot guarantee included with this shed, giving you peace of mind that this will be a useful building for many years to come. The 8’ x 6’ Premier Groundsman Potting Shed certainly lives up to its name, as we can imagine that this is a building that the enthusiastic gardener could potter about in for hours. The unique combination exterior combined with an incredibly bright, spacious and practical interior means that this is a shed that means business. 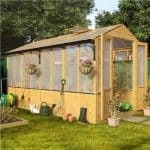 At this fantastic mid-range price you are getting a multi-functional shed that will create the optimum environment for all of your growing and outdoor projects. A winner all round.